I don't know where you're reading this from, but here, it's hot. I'm surrounded by a thick blanket of steamy heat, the kind that brings out atavistic instincts in Southerners like me; I feel driven to seek out a verandah (and possibly a ceiling fan) and sip iced tea and endeavor to move as little as possible. Alas, my ancient yearnings must (once again) be denied, as not only do I have to work for a living (with all the wearing-of-pants that that implies), I live in New York City, where items such as verandahs are in short supply. However, I have a cocktail shaker and, assuming I remember to fill the trays, plenty of ice. As Embury said, cocktails "must be well-iced," ensuring an appropriately frigid sip to cool the throat and bring the rest of the corpus to a more reasonable temperature. The lethargy brought on by summer's heat means that I don't tend to want to fuss too much. I love me a Corpse Reviver No. 2, but when I've gotten home from a long day and have been packed in a subway car and am feeling parched and gummy, I want something a little less painstaking. I've been subsisting on cooling drinks that are relatively simple, but nonetheless refreshing. The Americano. The Old-Fashioned. The Jack Rose. And, what I made for myself yesterday evening after I arrived home, kissed the best gal, and showered off the stickiness: the Gimlet. We sat in the corner bar at Victor's and drank gimlets. "They don't know how to make them here," he said. "What they call a gimlet is just some lime or lemon juice and gin with a dash of sugar and bitters. A real gimlet is half gin and half Rose's Lime Juice and nothing else. It beats martinis hollow." It truly is hard to beat the combination of gin and lime, though Chandler's proportions aren't quite to my taste; they can lead to a sticky-sweet drink, and isn't banishing stickiness the whole point of this exercise? We need something appealingly incisive -- like the drink's namesake -- to cut through the goo. 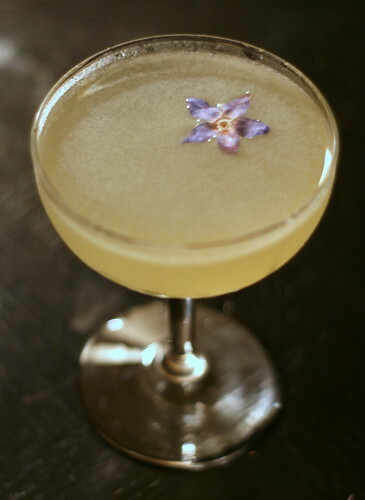 Shake and strain into a chilled cocktail glass, and garnish with a lime wheel, borage flower, or something equally appealing. I love the Chandler Gimlet and drank a few in Buena Vista, Co, recently with our pal Suzanarama. The bar staff looked at me as if I was crazy when I ordered them.